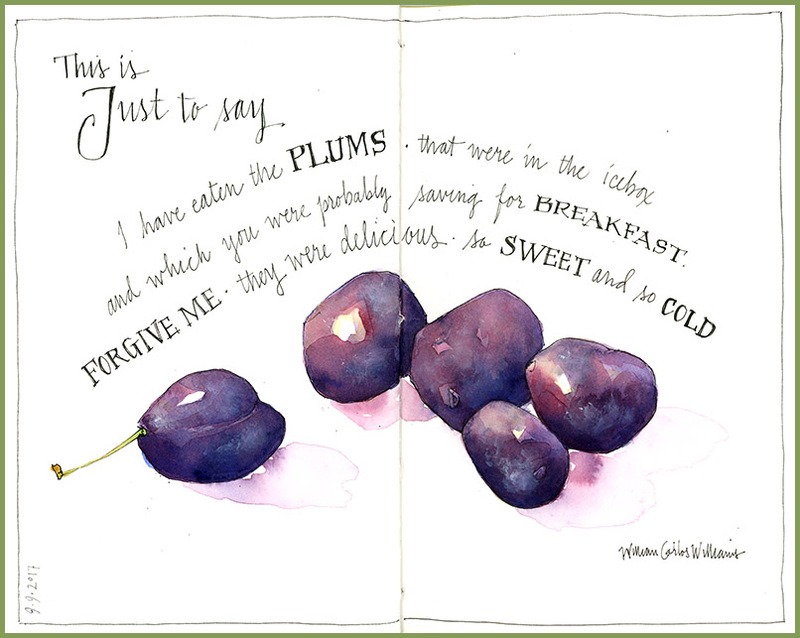 This is just to say…buy some plums (or tomatoes, corn, or apples). Paint them. Eat them. And savor the moment. Tips & Techniques- I realize that several of these plums look more like purple potatoes than plums, and you may have artwork that doesn’t quite turn out as you would like, too. One way to “save it” is with text that captures something of your experience. Another is to try again (this is my second attempt—my first had better plums but a less interesting layout). Another is to turn the page and be glad that you took the time to practice. Art and olive oil…a fine combination. If you’d like to try it, contact AJO Imports. Short on time but long on patience, I often need to quickly put pen to paper in my journal, get a first wash of color down, and then come back to finish later. 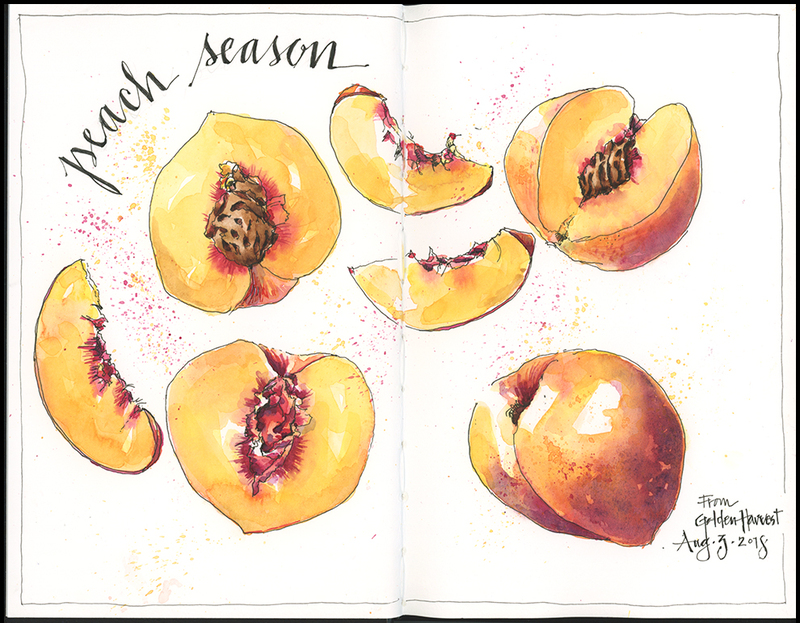 The result is a journal full of sketches that took five minutes to start but five days to finish. I don’t really mind—working fast and loose has its merits. 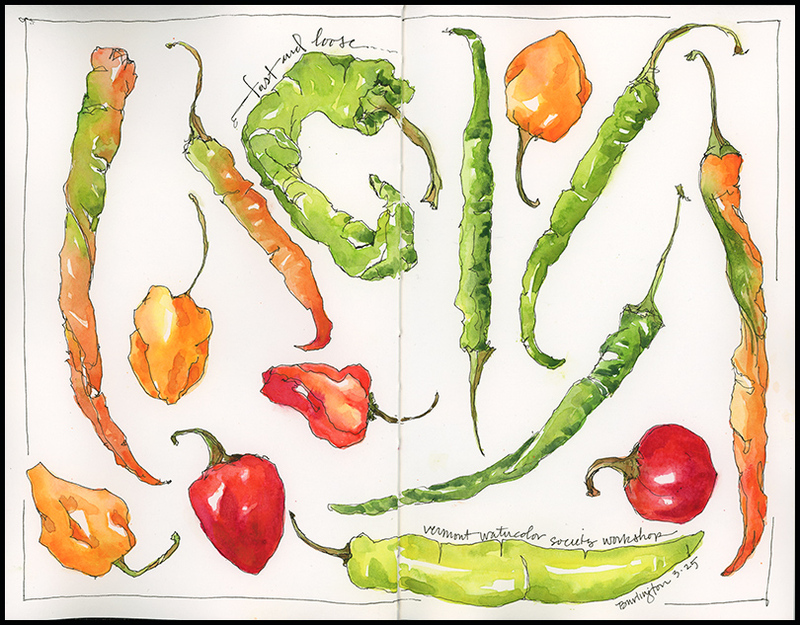 For one, my sketchbook would be empty if I waited until I had a big block of time for art. It has improved my hand-eye coordination. And it has kept in check my prior tendency to be slow, controlled, and precise. Tips & Techniques– Practice a few 30 second, 1 minute, and 3 minute contour and semi-blind contour drawings with a fairly simple subject. Fruits and vegetables are perfect. Work in pencil or pen, but don’t erase. See if you can get most of your subject down in just a few minutes. Next add a loose and light wash of watercolor. Let it dry. Then repeat; add two or three more layers of paint to deepen the colors and add depth. One trick to this method is to suspend judgment in the early stages. My sketches often look downright sloppy at the start, but I know that the watercolor will transform them. You can always tighten up as you progress, but it’s hard to make controlled sketches seem loose after the fact. 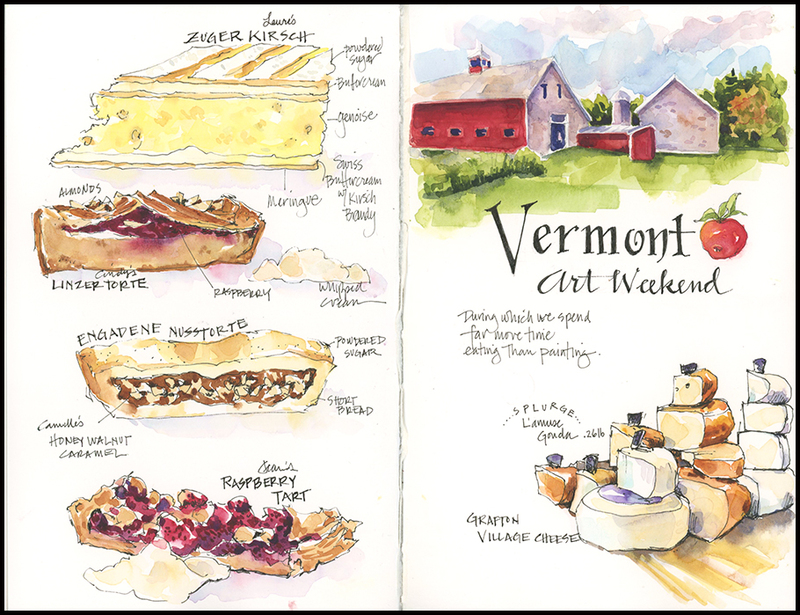 I introduced this technique with participants at a recent workshop on illustrated watercolor journaling that I offered at the Vermont Watercolor Society. 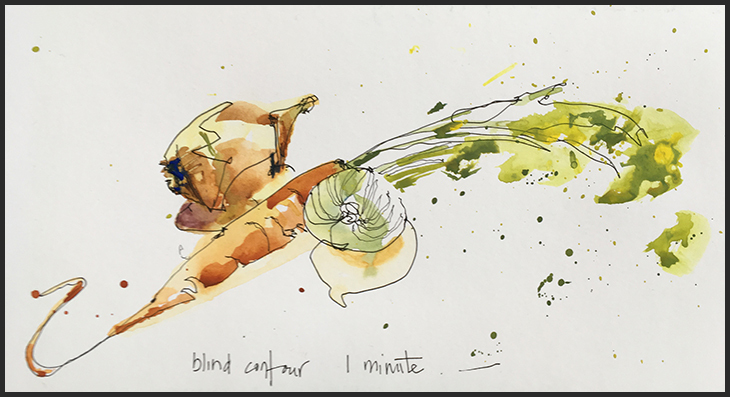 Look how great this 1-minute sketch by one of the participants turned out with a just a couple of washes of watercolor. 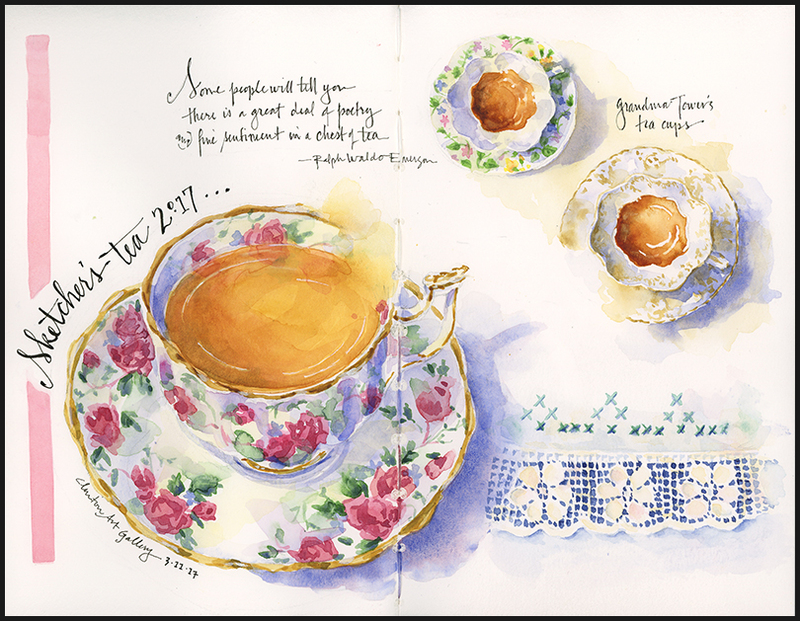 I recently hosted a Sketcher’s Tea—an excuse, really, for sketchers to come out of isolation in March and share a cup of tea and an afternoon of painting together. 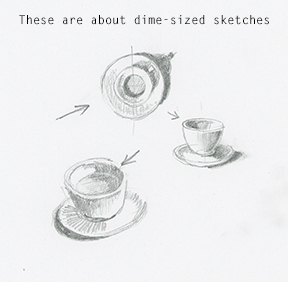 Sketching tea cups seems straightforward enough. And yet, there are lessons to be learned each time I do it. 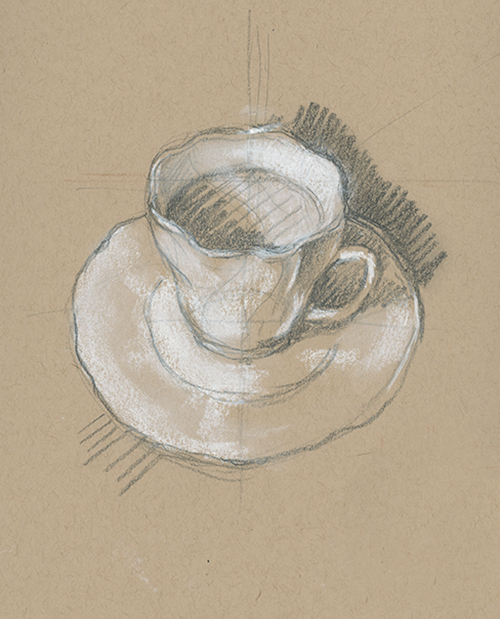 Perspective, shadows, painting whites, lost edges, reflections, patterns…the art of mastering the simple and the complex is what makes sketching tea cups both challenging and fun. Tips and Techniques– I often start by making a small value sketch so that I know where the lights and shadows fall. It can be hard to tell with all the patterns on the cups or if the lighting is coming from multiple sources. The paper sketch makes it easier to translate the values to the painting. You don’t need to spend a lot of time on this– couple of minutes might be fine.